Theilman Home Improvements LLC was established in 2004 but we have a lifetime of experience behind our proven quality workmanship. Our goal has always been to listen to, and understand, our customer's wants and needs, then do the job on time to meet the home owner's satisfaction. We go the extra mile to exceed all expectations! You won't find another company that will give you better value for your money. Superior workmanship and our great customer service don't come by accident. It takes commitment and organization. Our knowledge and experience in construction have provided our clients peace of mind and a home they can be proud of. Your complete satisfaction will always be our first priority. Trusted in the industry since 2004, Theilman Home Improvements LLC has been doing General Contracting with area home owners in the Northwoods, assisting them in home improvement, remodeling, maintenance and repairs. They have built up an extensive reference list. 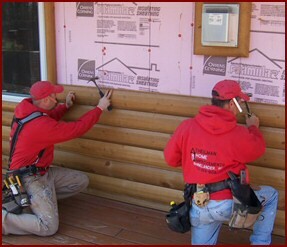 Theilman Home Improvements LLC is one of the most highly respected construction companies in the Northwoods. Customer Satisfaction: A job well done at Theilman Home Improvements LLC doesn't mean it's going to cost you more. We take pride in our quality workmanship, and in our customer service. We strive to get the job done on time in a cost efficient manor and customer satisfaction is very important to us. Value: Our mode of operation, low overhead and aggressive pricing mindset all combine to bring you industry-leading performance at reasonable and highly competitive cost. Peace of mind: We have completed hundreds of projects successfully and to our clients' delight. We will do no less for you as your General Contractor. EMPLOYEES with OLD SCHOOL CRAFTSMANSHIP, not sub-contractors, will do the work. And all of our work is guaranteed to your satisfaction. Northern Wisconsin is an extremely competitive market for home remodeling and we are confident you will find us to be the best value and with the highest caliber workmanship. Disclaimer: All information deemed reliable but not guaranteed and should be independently verified. Theilman Home Improvements LLC or By Request LLC, shall not be responsible for any typographical errors, misinformation, misprints and shall be held totally harmless.